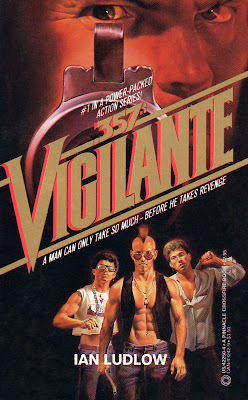 There’s a lot to like in the eponymous-titled debut of the '.357 Vigilante' series (Lee Goldberg as Ian Ludlow), and the story drew me in pretty quickly. A cop in Los Angeles is cornered by a street gang which burns him to death. The guilty parties beat the rap and walk out of the courtroom smirking, and the cop’s grieving son goes into vigilante mode to bring them down, one by one. All of this material is very good. The author moves the story along and makes it seem fresher than it really is. Published in 1985, it was written two or three years earlier, and I enjoyed the scattered pop-culture references which brought the story’s setting to life (how often do you see a novel that mentions X and Oingo Boingo?). The hero’s confrontations with the surly gang members are taut and exciting, and each take-down is bloodier and more difficult than the last. Meanwhile, the police are rapidly figuring out the mysterious vigilante’s identity and they’re closing in. To them, he’s just another murderer. And then, in the final quarter of the novel, it all goes south. Our hero, Brett Macklin, has been presented as an ordinary guy, pushed by grief and anger into taking the law into his own hands. The story really worked for me on that level, but just as Macklin completes his task, we learn that a ridiculously unlikely conspiracy has been going on. An evil televangelist and a crooked politician have been using street gangs to kill people and Macklin has gotten too close to the truth. He needs to be eliminated, which leads to an epic showdown including explosions, torture, narrow escapes, Macklin hanging from the underside of an elevator car and a helicopter, a high-speed chase through Hollywood and a death by wood-chipper. In other words, suddenly we’re in a silly ‘80s Mack Bolan adventure and our Everyman hero is no longer an ordinary guy with normal limitations and vulnerabilities. That’s where the novel lost me. Yes, the book had some flaws even before this point. It was a little long and wordy for such a simple plot and the author (still a college student at the time) was often trying too hard to turn a colorful phrase. But until that left turn, the story was compelling and believable. You hate to see your team blow a lead and lose the game in the final quarter, and that’s how I felt about “.357 Vigilante”.